To migrate your email by using Internet Message Access Protocol (IMAP) migration, Office 365 needs to know the name and connection settings of your IMAP server. Office 365 needs the name of the source email server to migrate mailboxes from. In this task, we describe how to get the name of the email server by using Outlook on the web (formerly known as Outlook Web App). If you don't have access to Outlook on the web, or if your IMAP server name isn't listed there, either contact support or consult the help documentation for your source email system. Note: The IMAP server for Gmail is: imap.gmail.com. 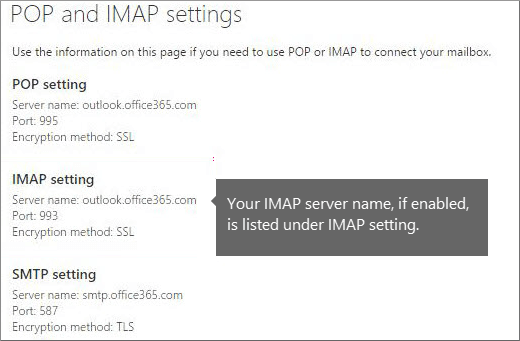 For more information about IMAP connections in Office 365, see POP and IMAP email settings for Outlook. Office 365 also needs the values for the encryption method and the Transmission Control Protocol (TCP) port number that's used by the source email IMAP server. Security: This is the encryption method used by the IMAP server. The default value for secure sockets layer (SSL) is appropriate for most IMAP servers. Port: This is the TCP port number that's used to connect to the IMAP server. In Office 365, the only available value is 993 for SSL connections. Port 993 is appropriate for most IMAP servers.